← Please, Go Here. Read This. Dressing has its rituals. Or at least it should; that’s part of the fun. Beau Brummel used to hold court during his toilet. He should have charged admission, or sold season tickets to stave off his inevitable bankruptcy. As long time readers know, I am a fan of the dressing gown, that half way point between fully armoured and half-dressed. 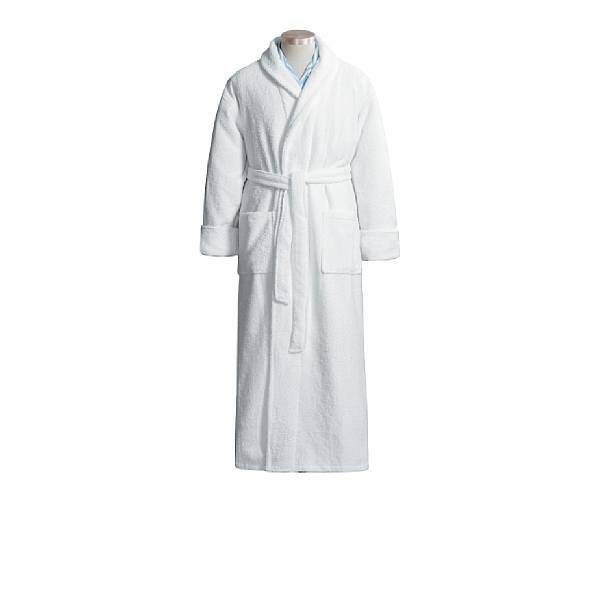 But one of the most effective, comfortable and elegant ways to step from the shower or bath and make your way to the sink to shave is to envelope yourself in a 100% cotton Turkish terry cloth robe. An invigorating toweling off is good for the circulation, sure. But in winter, especially, it can be drying on the skin. Better to trap the moisture next to you for a bit and let the robe absorb the excess. Choose the thickest you can find. The colour is up to you, but I prefer a stark white. 20 ounces or more (over 450 grams which is about 16 oz. per yard) if possible. Thicker means more absorbent and longer-lasting. Best of all in these tight times, you can throw it in the wash once a week instead of having to dryclean your silk or woolen robe. If you haven’t acquired one from your favourite five-star hotel, you might try LL Bean’s 12.5 oz. version, Digital Threads’ 16 oz. version (FYI, I haven’t bought from them), or Turkish Towels heavy and soft version(Again, an unknown source), or the 14 oz. Sierra Trading Post offering in the photo above. Just the way to start off the weekend. This entry was posted in Elegantology and tagged Beau Brummel, LL Bean, Sierra Trading Post, Turkish Terry Cloth Robe. Bookmark the permalink. it is so muggy in Fla Fla that i do not dare wear a terry. i need one that is is like the ’tissue’ weight T’s. something so light , it would blow away without something rested on it. I have a linen one with a waffle weave for summer. Oh my. What a charming blog you have here . . . glad I found you as well. I am a huge fan of the white terry shawl-collared robe as well. My new delight, after reading a post from uber-sartorialist Scott Schuman, was to use a white face-cloth as a pocket square in the pocket of the aforementioned robe. It’s a great way to start the day! Hello Ms Finberg, as Mrs. PvE says, the waffle weave should do nicely. I would say that seersucker would stand away from the skin, but I’m not sure if it would absorb as well. Hmmmm…. I might just have to dry off poolside after a morning dip. Tartanscot, I saw that post and was very amused. My terry robe, alas, has no breast pocket. An oversight upon purchase. Next time! White is the urest of all colors and it is symbol of cleanliness. It is my favorite as well. And actally I have one and I love it.